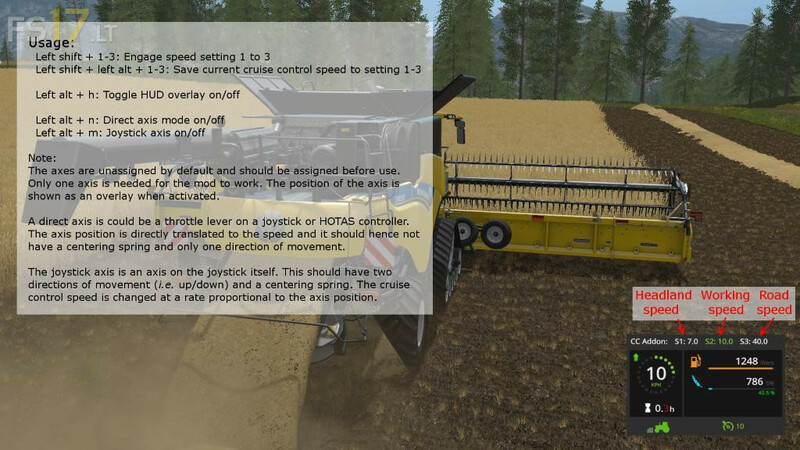 Extends the cruise control of vehicles by allowing the player to save three speed settings and easily setting the cruise control to these speeds. This could be working speed, headland speed, and road speed. The saved settings are shown on an HUD overlay, when enabled. Additionally, two kinds of axes can be assigned to the cruise control to change the speed continously from 1 KPH to the active setting. This is how modern tractors with variable transmission work. The axis can be in joystick mode (like New Holland and Fendt tractors) or direct input (like Case and most combines). Joystick mode works with any generic joystic while direct input mode works with throttle axes without centering springs and no negative axis. The output is shown graphically as a HUD overlay. This mod works very well with the Drive Control mod but it is not required.